Everything starts with the right display. Although many people try to use indoor televisions outdoors, this is never a good long-term solution. Sunlight will cause unbearable glare and, more importantly, your equipment will likely malfunction due to the elements. A lot of companies focus exclusively on creating outdoor TVs designed to deal directly with these issues. None has better offerings than Séura. Their TVs weather the most extreme conditions to deliver the same quality year-round, rain or shine. Look for a model that meets your unique needs whether you expect to have your television in direct sunlight or a shaded area. Every model includes their trademark anti-glare technology and adaptive picture technology which adjusts brightness and contrast in response to changing lighting conditions. Though Séura has models available for any environment, we do recommend placing your television in a shaded area. For one, it’ll help eliminate most glare on your screen. On your end, you’re going to enjoy hours of television a lot more if you’re not sitting in the hot sun. When it comes to your television, you also want to consider the direction of the sun. Light may not affect your screen, but it will undoubtedly affect you. Try to have your TV facing south, so you're never looking directly into the sun when watching your display. Ultimately even the best TVs are going to be useless if you have nothing to watch. A lot of installations go wrong because people try to use HDMI cables to cover the long distance from their source components indoors to outdoor TVs. A professional can design the ideal wiring foundation with Cat5/6 or fiber cables to get high-quality signals to your brand-new TVs. In the planning phase, figure out what you want to watch – like cable, over the air programming, or streaming content - so your AV technician can create the right setup for you. 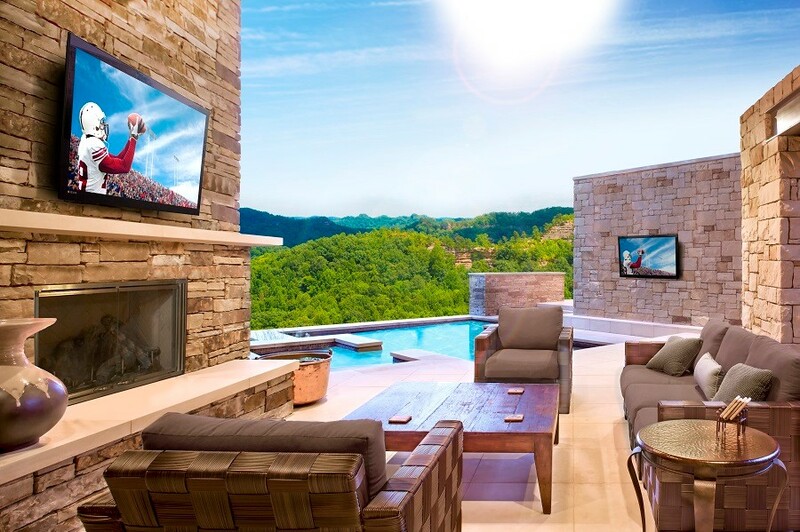 As with your TVs, you want a control option that works for the outdoors. You can use waterproof remotes from Séura or find what you wish to watch through Savant's mobile app. If you want to change the channel, switch from Netflix to cable or adjust the volume, there’s no need to go inside or use five different remotes to do it. Now is the best time to bring some added entertainment to your outdoor spaces. To get started, call us at (210) 858-6954, fill out our contact form, or reach out to a chat representative.